LAS VEGAS – Conor McGregor wouldn’t say Wednesday whether he’ll bet on himself to upset Floyd Mayweather Jr. on Saturday night. McGregor was asked about betting on himself during their largely uneventful, final press conference at MGM Grand because a report Tuesday by Inside Las Vegas stated Mayweather will bet $5 million on himself to beat McGregor. The report cited “a trusted Vegas source” for the information regarding Mayweather’s intentions. Mayweather was slightly more than a 5-1 favorite over McGregor on Wednesday at MGM Grand’s sports book (-525). A $5 million bet at those odds would bring back roughly $952,000 if Mayweather won. The 40-year-old Mayweather is expected to earn more than $200 million from his first fight since he easily out-boxed Andre Berto in September 2015. The undefeated boxing legend has neither confirmed nor denied whether he’ll place that huge bet on their 12-round, 154-pound boxing match at T-Mobile Arena (Showtime Pay-Per-View; $99.95 in HD). 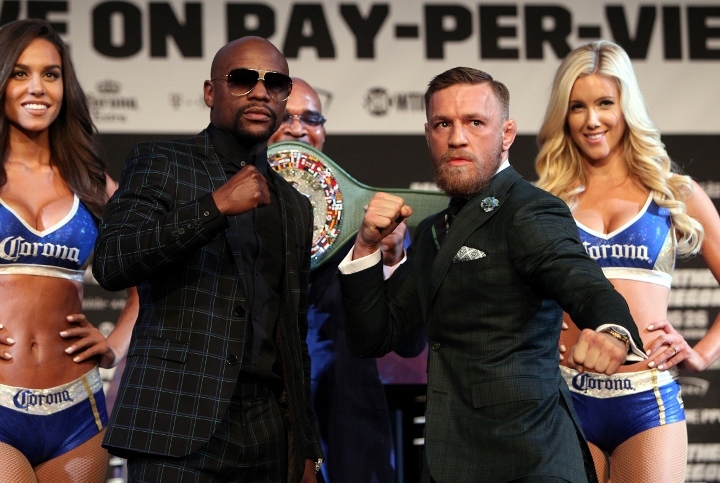 The odds on a Mayweather win aren’t higher because most bets placed on the fight at Las Vegas sports books and elsewhere have been made on McGregor, a UFC superstar who’ll make his boxing debut against the best boxer of this generation. Las Vegas’ Mayweather (49-0, 26 KOs) is well-known for posting betting slips on social media from enormous wagers he places on NFL, NBA, college basketball and college football games. Ireland’s McGregor claimed Wednesday that Mayweather’s gambling habits have forced him to take their fight, despite that Mayweather has made more than $600 million during his 20-year pro boxing career. [QUOTE=danceswithfire;17975198]gambling problem plus irs problem =uh oh will shall see floyd in an old navy commercial in 5 years[/QUOTE] Floyd still hasn't cashed the initial 100 million dollar check from the pac fight. I would love to have that problem.